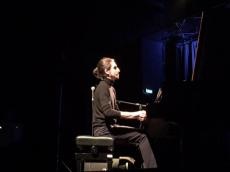 Isfar Sarabski, Azerbaijan’s well-know young jazzman, pianist and composer gave a solo concert organized by The European Azerbaijan Society (TEAS) at “Sunnyside” Jazz Festival in Reims, France. Azerbaijani jazz music, distinguished by its melody and rhythm, was warmly welcomed by jazz fans. The young jazzman started his solo concert at the Cartonnerie Music Hall in Reims, with Auryol, a new song that has not yet been included in his album. Sarabski then impressed the audience with the popular song "G-Man" filled with melodious tones. The musician then performed Chet Baker's version of the standard jazz ballad "Blame it on my Youth". As stated by the young jazzman in his interview with Azertag, the solo concert at the Reims Jazz Festival was the beginning of his European tour, and concerts in Belgium and other cities of France, as well as in UNESCO. The musician noted that the Azerbaijani jazz is constantly evolving. International competitions, festivals and concerts held in the country are an example of this. Noting that jazz has a special place in Azerbaijani culture, he recalled that Baku won the title of Jazz Capital in the Soviet era. The young man playing splendid compositions in piano inspires many with this magic musical instrument. He is attractive with his smart talent. He thrills up the souls of many lovers with his enigmatic music. The talented composer expresses his feelings, emotions and moods through music. His energy and style have a magical effect on the audience, bringing people into a trance and taking them into the world of music. Isfar began playing the piano at the age of seven. He studied classic piano for eleven years at the Bulbul Music School in Baku. His early influences included Louis Armstrong and Dizzy Gillespie, while Keith Jarrett, Brad Mehldau, Bill Evans, Oscar Peterson, and Vagif Mustafazadeh have inspired Sarabski to compose his own music. Sarabski was merely twenty when he won First Prize in the Solo Piano competition at the 2009 Montreux Jazz Festival. His success led to his name's entry in the Golden Book of Young Talents in his native country, and he was awarded the title "Honorary Artist of the Azerbaijan Republic", a country where jazz has continued to bloom since the thirties. Isfar's music skilfully mixes classical American origins with mugam, traditional Azerbaijani music, to form mugam-jazz-fusion with such emblematic artists as Vagif Mustafazadeh (the father of "jazz princess Aziza") or Bayati Shiraz." Sarabski is a laureate of State prize titles "Zirve". In 2009, Isfar became the winner of the International Jazz Festival "Montreux jazz festival" in Switzerland.